Kolkata, Jan 11 (IBNS) Forty years after he first opened his medical bag and started treating the poorest of the poor on the pavements of Kolkata, Dr Jack Preger has decided to retire. Now aged 88 he is keen to return to the UK, and in mid-January he will leave behind the city where he has lived and worked for four decades. In that time Dr Jack has helped more than 500,000 people and set up an award-winning charity, Calcutta Rescue. It provides medical treatment and education for people living in some of the city’s most deprived slums. Dr Jack has frequently been compared to Mother Teresa in terms of his total commitment to the poor and the impact he has had on the destitute in Kolkata. However, his approach was very different and he has received far less recognition for his extraordinary achievements. 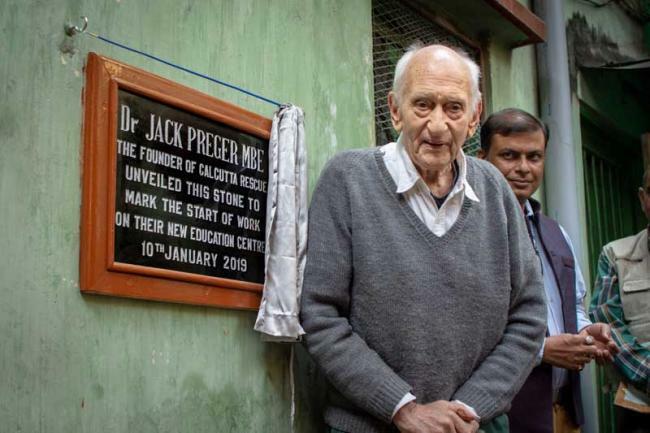 In his final act as Chairperson of Calcutta Rescue, Dr Jack was given the honour of unveiling a foundation stone at the site of the charity’s new education centre in North Kolkata. A fundraising campaign is underway to renovate the old building which, when open, will support around 350 children from nearby slums. The British doctor is widely regarded as the grandfather of street medicine, and helped pioneer many of the practices now used to treat the poor around the globe. This includes work on tuberculosis, leprosy and Aids –for many years his charity was the only place in Kolkata where people could get free HIV drugs. Despite his age and failing eyesight, Dr Jack has continued to play an important role in guiding Calcutta Rescue. He frequently visited the clinics, where he used his wisdom and huge experience to ensure patients received the best possible care. Dr Jack said he had great confidence in the charity’s Chief Executive, Jaydeep Chakraborty, and the management team, and appealed for people to continue to support the charity after his departure. Chakraborty said: “Dr Jack has selflessly and quietly gone about his work of serving some of the poorest citizens in the world. Those of us who work with him have seen the manner in which he has done it and the things he has given up – he leads an almost monastic existence. Born in Manchester in 1930, Jack Preger studied at Oxford University before becoming a farmer in Wales. He ran a remote cliff-side farm near Cardigan for eight years. But, whilst driving his tractor there one day in 1964, a mysterious voice told him to become a doctor – prompting him to sell the farm and start a degree in medicine at the age of 35. Following a radio appeal, he went out to the newly-formed Bangladesh where he established a 90-bed clinic for war refugees and two farms where they could live and work. But he was deported in 1979 after exposing a child-smuggling ring. He moved to Kolkata, where he began providing free medical care to some of the multitudes living on the streets in abject poverty. Alone at first, and with very little money, he opened his medical bag and started treating patients on the pavement under a flyover. Over time Western travellers saw the vital work he was doing and stopped to offer money and help. He faced repeated challenges, from crime bosses to hostile bureaucrats who forced him to fight repeated legal battles to continue his life-saving work, which even led to him being jailed at one point. But, with support from people in Kolkata and around the world, including Sir Edmund Hillary who conquered Everest, he persevered and finally managed to establish Calcutta Rescue as an Indian-registered charity. In 1993 Dr Jack was made a Member of the British Empire for his “continued perseverance and incredible selflessness”. In 2017 he became the first living non-Asian to win an Asian Award when he was named Philanthropist of the Year. In August 2018 he was inducted into The Telegraph newspaper’s coveted Education Foundation Hall of Fame.